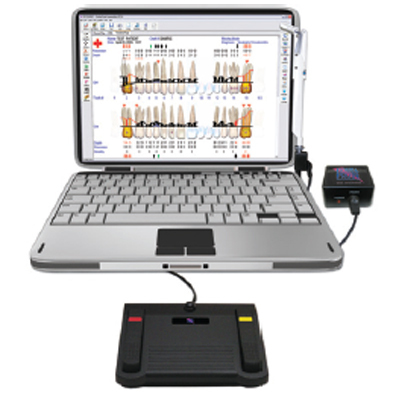 The Probe provides an interactive exam that dramatically increases patient acceptance of periodontal treatments. While applying constant pressure, the automated, talking Probe records all parameters of a periodontal exam including pocket depth to the nearest 0.2 mm. With hands-free charting of bleeding, pus, plaque, furcation, and mobility, the Probe is great for saving time, educating patients, improving accuracy, and creating a 'treatment map' for scaling and root planing, subgingival antimicrobials, or laser use. Software, hardware, and training are included.